Digital flyers are something a lot of restaurant owners don’t necessarily think of when advertising for restaurants. As a restaurant owner, you may be thinking that print flyers are the better way to go because people will be reminded to check out your establishment; however, that’s not always the case. In fact, digital flyers are one of the best ways to get the word out, especially to the younger crowd. Millennials are the future, after all, and by migrating toward digital flyers instead of printing advertising for restaurants in yellow pages, TV guides, and phones books, you can reach more of the younger demographic. While families are great to target, millennials tend to go out to eat more, grab drinks with friends, and head out for dates to find that special someone, so they tend to know more about what’s happening in the foodie world. Digital flyers can be a great way to target a wider demographic due to how many more people they can reach. If you’d like to try digital flyers, then That’s Biz can help! Just contact us today so we can get started. If you’re feeling a little on the older side because you don’t know what digital flyers are, then don’t worry. 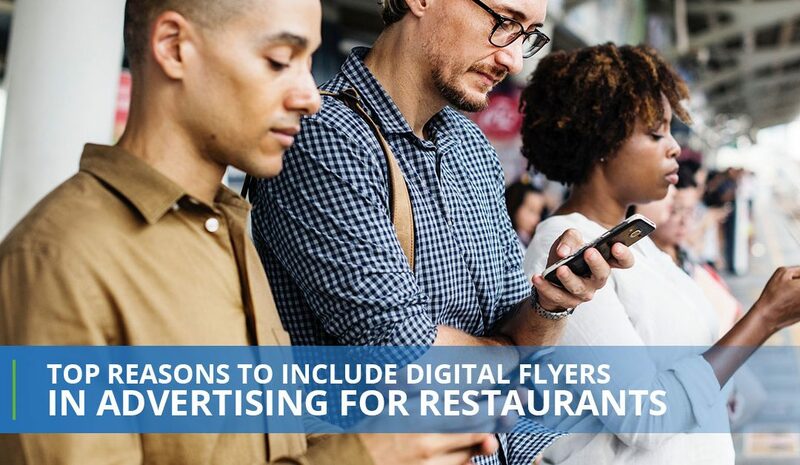 We can help you understand how digital flyers can help you when it comes to advertising for restaurants and how to use them. That’s Biz has a variety of services and products that are meant to make marketing easier for your chain, bar, or restaurant. One of those areas that we can help you with is saving gobs of money and digital tracking, which is what digital flyers can provide for your business. Digital flyers are an advertising method that provides your customers with information about your establishment. Instead of a printed piece of paper, the flyer is sent in digital form. That can mean anything from being texted to your target demographic to emails. The digital flyer is all online, which makes it easily customizable. Instead of printing out 200 flyers to hand out on a street corner, you can create an innovative, informative, and inviting flyer that details your message. Maybe you’re having a grand opening or you have a new, delicious menu item that you know will be a big hit. Whatever the case may be, digital flyers are a simple and beneficial way to show your potential customers why they should make their way down to your bar, chain, or restaurant. It’s important that before you send out the digital flyers that you have a thorough and in-depth email list. The email list will help you know who to target, who is interested in your establishment, and what those interests may be. A great way to set up an email list is to utilize guest WiFi services, which That’s Biz can help you with. What Can Digital Flyers Track? One of the most important factors of digital flyers is how it can track the information you need. Digital flyers will track the number of people who viewed the flyer, the coupons that were looked at, the types of offers they may be interested in, who placed an online order, the coupons that were redeemed, and who stopped in with specific coupons. What’s great about tracking digital flyers is how easily you can gather data to see what is working and what’s not working. When you notice that people are bringing in a specific coupon, then you can begin to take that into account when you decide on another promo or deal you’d like to do at your restaurant. When you begin to track your digital flyers, you can see the positive results that come from using this advertising for restaurants, bars, and chains method. Some of the results you can get from digital flyers are knowing who is interested in your restaurant, bar, or chain, tracking what you should do in the future and what you should stop doing, and specific areas that show more interest than others. By understanding your results, you can begin to make the necessary changes and instant update since everything is online. Additionally, digital flyers can reach people faster, so you’ll get the results you want quicker. Stay tuned for our next blog to learn more!